At The Duke Company we remain very grateful for our customers, our families, our friends and our great nation. We wanted to share with you a great tribute to our nation, courtesy of the Wall Street Journal – ‘Pilgrims and the Roots of the American Thanksgiving‘. “In the fall of 1621, 50 English men and women and 90 Native Americans gathered at New Plymouth in Massachusetts”. During their initial Winter in the United States, half of the pilgrims died from “malnutrition and disease”, and they “struggled to farm the land”, writes Malcolm Gaskill. The First Thanksgiving 1621 by Jean Leon Gerome Ferris in 1899. Source and Copyright: United States Library of Congress. “Our harvest being gotten in, our governor sent four men on fowling so that we might after a special manner rejoice together after we had gathered the fruits of our labor.” The Pilgrims, as they would later be known, celebrated for three days—an event immortalized in American history as the first Thanksgiving”. The values and strength of our great nation, originating from the Pilgrims, perseveres today. To all of our friends through-out Upstate and Western NY who rely on us for equipment rental, tool rental, building supplies and rock salt & ice control products, our team is humbled to be able to earn your business. The Duke Company wishes you and family a blessed and Happy Thanksgiving! 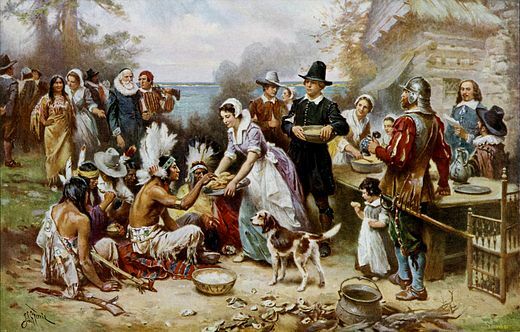 To read the full article on the Wall Street Journal’s web site about the origins of the American Thanksgiving and the sacrifice of the pilgrims, click here.